When he taught Near Eastern and Judaic studies at the university, Nahum Glatzer, H’73, represented the Brandeis ideal: an eminent scholar as committed to teaching and mentoring his students as he was to pursuing his own research. Now, with a $250,000 gift from Susan Feigenbaum ’74 and Jay Pepose ’75, MA’75, P’08, P’17, Glatzer’s impact on a generation of Brandeis professors and students will be memorialized through an endowment that creates the Nahum Glatzer Teaching Scholar Prize. The prize will recognize tenured Brandeis faculty who are outstanding teachers and scholars, and exhibit the humility, kindness, integrity and good humor that characterized Glatzer’s interactions with students and colleagues. Each prize recipient will receive a $10,000 award and a commemorative medal. One of Glatzer’s former students, Jonathan D. Sarna ’75, MA’75, University Professor and the Joseph H. and Belle R. Braun Professor of American Jewish History, will chair the faculty committee that reviews Glatzer Award nominations. The award will typically be presented in alternate years, depending upon the quality of the nominations. Glatzer, who died in 1990 at age 86, taught at Brandeis from 1950 to 1973. He chaired the Department of Near Eastern and Judaic Studies for 11 years. Feigenbaum, herself a professor and prominent teacher-scholar in the field of economics, says she “majored in Glatzer” while completing her dual majors in Near Eastern and Judaic studies, and economics at Brandeis. Glatzer’s “humility, deep respect for students and their ideas, and his understated way of conveying his incredible insights” made him a role model for her career, she explains. 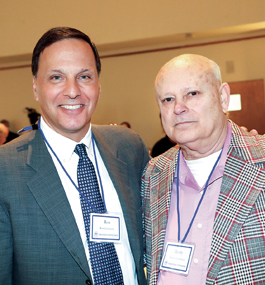 Feigenbaum and Pepose have long been generous donors to their alma mater. In 2009, they made a gift through the Lifelong Vision Foundation that created a $1 million endowment to fund the annual Jay Pepose ’75 Award in Vision Sciences and support graduate research fellowships in vision science. Born in Lemberg, Austria, Glatzer pursued his PhD at the University of Frankfurt under the guidance of Martin Buber. Glatzer succeeded Buber as a lecturer on Jewish religious history and ethics at the university. He fled to Palestine with his wife in 1933 as Hitler came to power, and taught literature in Haifa before moving to the U.S. in 1938. 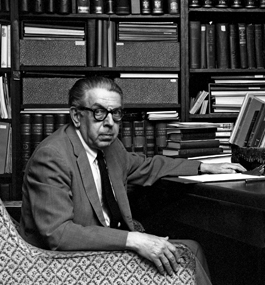 Glatzer authored more than 250 books and articles on subjects ranging from Franz Kafka to Jewish prayer. He edited several English translations of Kafka’s works as well as books by Buber and Nobel Prize laureate S.Y. Agnon. In addition to Brandeis, Glatzer taught at the College of Jewish Studies, Hebrew Theological College, Hebrew Teachers College, Yeshiva University and Boston University. He received honorary degrees from Brandeis, the University of Southern California and the University of Florida. 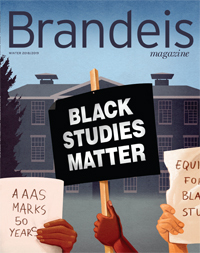 Brandeis recently received several important grants from leading foundations. • The Andrew W. Mellon Foundation awarded Brandeis a two-year $700,000 grant to support the Graduate School of Arts and Sciences’ Re-Imagining Doctoral Education in the Humanities initiative. The funding will enable the school to extend its Dissertation Year Fellowship program, which provides resources to PhD students in the humanities and humanistic social sciences to enable uninterrupted work toward a dissertation’s completion. The new grant will help sustain a set of programs, first launched with the Mellon Foundation’s support in 2009, which have helped reduce the time to a degree and created cross-disciplinary bridges and support mechanisms for Brandeis doctoral students. Additionally, James Pustejovsky, the TJX/Feldberg Professor of Computer Science, received a grant from the Mellon Foundation to lead an international collaboration seeking to enable the leading U.S.- and Europe-based platforms for computational language analysis to talk to one another. Through the grant, the project team, including professors from Vassar College; the University of Tübingen, in Germany; and Charles University, in Prague, will be able to make their services mutually accessible and interoperable. • The Heller School’s Institute for Child, Youth and Family Policy received a three-year $3.1 million grant from the W.K. Kellogg Foundation to build the next generation of diversitydatakids. org, a pioneering data and analytics tool that provides insight into whether children of all racial and ethnic groups have adequate, equitable opportunities for healthy development. • The Chicago-based Alphawood Foundation awarded $206,045 to Charles Golden, associate professor of anthropology, to support archaeological excavations, epigraphic research, and regional surveying in and around the sites of Piedras Negras, Guatemala, and Lacanjá Tzeltal, Mexico. The work will investigate Maya politics and economies during the Classic period (c. A.D. 250-900) through comparative study of these neighboring, often competing kingdoms in the Usumacinta River basin. 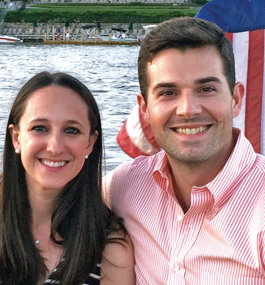 For Mariah Rich Collins ’10 and James Collins ’09, community engagement is a family affair. That’s why they founded the Rich/Collins Community Leadership and Impact Fellowship (CLIF), which, beginning this fall, will help Brandeis undergraduates design and implement their own community-service projects. Fellows will receive a grant of up to $5,000 to create a realistic, sustainable project that meets a significant community need. Program applicants submit a proposal that outlines both the project and an evaluation process that measures the project’s impact. CLIF is modeled after a program established at Rice University by Mariah’s grandparents, Hilda and Hershel Rich. Funding and support come from Rich/Collins family members, including Sharon Rich and Nancy Reed, Renie Rich Carniol, and Mariah and James. The family’s Brandeis connections run deep. Despite living 1,800 miles away in Houston, Mariah’s grandmother was an early member of the Brandeis National F Committee. Mariah’s mother, Sharon, became a BNC life member as a child. 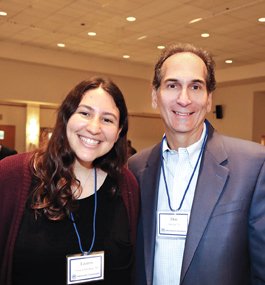 “My family always instilled in me that tikkun olam is not just something you do, it’s something you are,” says Mariah. As a Brandeis student, she was a coordinator for the Waltham Group and volunteered with many service organizations, including the Waltham Kids’ Club, Community Engaged Learning and Colleges Against Cancer. Both Mariah and James now work in the nonprofit sector — Mariah advises nonprofits on strategy, and James works at an antipoverty agency. They credit Laura Goldin, professor of the practice of environmental studies, with showing them such careers are possible. Goldin “took learning out of the classroom and into the community,” says Mariah. Through the CLIF experience, students both give back and become community leaders. “The skill set these students will develop will continue to benefit them long after they graduate from Brandeis,” James explains. Participants will be chosen in November by a selection committee composed of students, faculty, staff and Waltham community members. James, a former pitcher and captain on the Brandeis baseball team, says one spot on the committee will be reserved for a student-athlete. Mariah, who took part in the Albert Schweitzer Fellowship program while earning a master’s degree at Harvard, found the cohort model of that program beneficial. “Even though we were all working on different projects, we were able to learn from each other,” she says. The CLIF program will be organized along similar lines, allowing students to brainstorm and share ideas with one another throughout the year. Each CLIF cohort will receive ongoing training on a variety of relevant topics, such as grant writing and asset mapping. All CLIF projects will focus on Waltham or the Greater Boston area. “Students will be able to understand the needs of the local community and see firsthand the impact they can have,” says Sharon Rich. Because Malo worked with Mariah and James when they were undergraduates, he is not surprised by their generosity. “They really have an appreciation for the city of Waltham and how Brandeis engages with it,” he says. For their part, Mariah and James look forward to watching student leaders grow. CLIF is “about empowering students to figure out what problems the community is facing and address them,” Mariah says. The Brandeis family gathered to recognize the 2017 honorary-degree recipients at the annual Commencement Dinner. 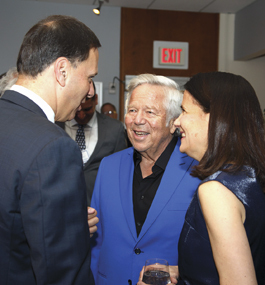 New England Patriots owner Robert Kraft (center), husband of late Trustee Myra Kraft ’64, with President Ron Liebowitz and his wife, Jessica. Honorary-degree recipient Deval Patrick, H’17, former governor of Massachusetts; his wife, Diane; Susan Curnan, Heller School professor of social policy and management; Jylla Tearte; and Trustee Curtis Tearte ’73. Students and the donors who support their scholarships enjoyed one another’s company at the annual Scholarship Appreciation Luncheon. President Ron Liebowitz and his wife, Jessica, with Trustee Lisa Kranc ’75 (far left), the luncheon host, and Ledia Erkou ’17 (second from left). Trustee George Krupp (center) with Sarah Levy ’17 and Jacob Markey, Heller MPP/MA’17. Liebowitz and Manny Landsman, G’20. 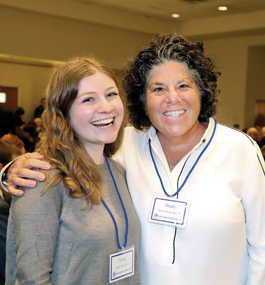 Emily Kessler ’19 and Trustee Mindy Schneider ’75. Margot Davis, Heller MA’05, PhD’08 (second from left), and Trustee Jonathan Davis ’75 (third from left) with Maytal Babajanian, Jared Martin and Lily He, all ’19. Lauren Grobois ’18 and Trustee Dan Jick ’79, P’09, P’12. Two members of the Board of Fellows were recognized for their service to Brandeis when they received their hoods. Nancy Winship, P’10, P’13, chief philanthropic adviser to the president; Fellows Elaine Reuben ’63 and Carol Finn; and President Ron Liebowitz.